British government surveillance agency GCHQ – counterpart of NSA – has fired-up another debate over the Internet by launching Android application to encourage teenagers to tackle emerging cybersecurity threats. The newly launched Android app, dubbed "Cryptoy", was developed by STEM (science, technology, engineering and maths) students on an industrial year placement at GCHQ. The Cryptoy app was highly appreciated and liked by GCHQ at the Cheltenham Science Festival that they made it available to download today. The app is designed mainly to tempt youngsters between the ages of 14 and 16 into trying their hand in cryptography and code-breaking, but can be used by anyone interested in cryptography. According to GCHQ, Cryptoy app will help users to understand basic encryption methods, teach the codes of the past, and create their own encrypted messages. 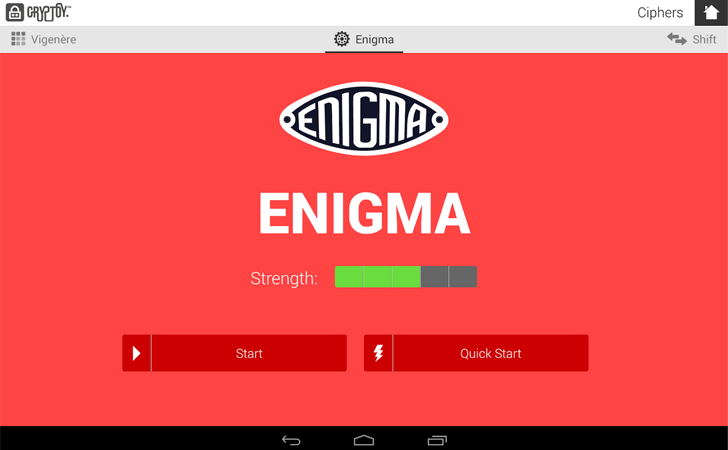 The app allows users to share these encoded messages by using four code-breaking techniques – Shift, Substitution, Vigenère and Enigma. The messages can be shared with friends via social media or email, which can then be decoded by recipients with the help of the app. One of the spokespersons from GCHQ said that the UK youngsters are needed to be motivated to take up subjects like maths and computer science. "If we're going to get the next generation of security experts, we need to be encouraging them to take up these subjects," she said at the conference, where the app was introduced and announced. "Building maths and cyber skills in the younger generation is essential for maintaining the cyber security of the UK and growing a vibrant digital economy," Robert Hannigan, Director GCHQ, said. "That is why I am keen for GCHQ to give something back through its work with school and universities." The agency says that the Cryptoy app only asks for very limited permissions and is not at all a surveillance tool – although the revelations by Edward Snowden made us all think 100 times before downloading and installing the app. You can download Cryptoy app now, which is available for free on the Google Play store. For now, it is available for Android platform, and an iOS version is pegged for release in 2015. The app works on Google's Nexus 10 and Nexus 7 tablets, and has been tested only on versions 4.1.2 and 4.4.2 of Android.